It is the year 2099 and Chad Channing, a student at Baxter High School, stumbles upon Reed Richards hiding from authorities who would see him dead or imprisoned. No longer possessing a body of his own, Reed's brain alternates between a robotic body of his own design and a robotic duplicate of his fallen comrade, the Thing. 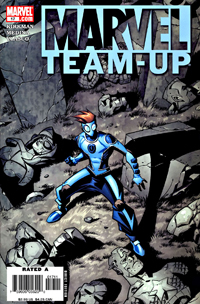 Reed teaches Chad how to use his mutant powers to protect those in need and standing up to the flawed Sentinels which patrol and police the city. When Chad's grades fall and he gets into trouble with his girlfriend, he begins to doubt whether or not he should continue. An incident where he saves the lives of citizens who would have otherwise been left for dead by the Sentinels convinces him that he is needed. Chad has a classmate named "O'Hara," clearly a nod to Miguel O'Hara, the Spider-Man of the original 2099. This version of Miguel was killed by Morlun in Spider-Man 2099 [v2] #5. In Latveria, an elderly man dressed in Doctor Doom's armor summons a younger man, Lucien, to his deathbed. Lucien kills the elder and assumes his role as Doctor Doom. In Wakanda, K'Shamba, a member of the ruling council is summoned to meeting. The meeting is abruptly ended by invasion. Doom and his army of Doombots invade and conquer Wakanda in 6 weeks. K'Shamba joins the resistance against Doom and quickly rises through its ranks to become the leader. Eventually he dons the mask of the Black Panther and successfully leads the liberation of Wakanda. After Doom's leaves Wakanda, he is still victorious. Unknown to anyone, K'Shamba is under Doom's control. 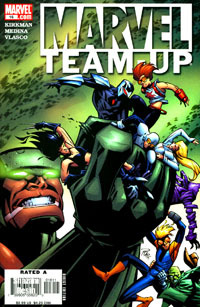 This issue was penciled by Kyle Hotz (Ghost Rider 2099). Fifty years ago, Black-Bolt led his people away from Earth just as the re-emergence of the Mutant Registration Act was bringing about the end of the Age of Heroes. He entered into cryogenic sleep along with his closest confidants while his subject maintained and piloted their escape vessel. Emerging exactly 50 years later, Black-Bolt is shocked to find that of his royal court he alone has woken up. Confronted by the Inhuman who in the interim has been keeper of the Terrigen Mists, he reveals that he murdered his friends as they slept. The keeper reveals his identity, Maximus the Mad. Taunting Black-Bolt with the murder of his wife, Black-Bolt speaks. The resulting sound destroys the vessel, killing everyone on board and leaving Black-Bolt floating in space. When Cossandra Natchios learns that she is dying of cancer, her son Franklin's life is turned upside down. Cossandra reveals to Franklin his true heritage. She is the daughter of Frank Castle and Elektra Natchios, the infamous vigilante and assassin. With her time almost up, she decides Franklin is overdue to take up the family business of and accept the Punisher legacy. She puts Franklin through an intense training with the aim of preparing him to take over the Punisher mantle once she dies. But Franklin his hesitant to kill anyone. He's not a killer. When Cossandra eventually dies, Franklin puts the Punisher legacy to rest. Samuel Fisk is the grandson of Wilson Fisk. To make up for the pain and sorrow his family has wrought over the years, he has assumed the mantle of Daredevil, his family's worst enemy. He fights what little crime is not handled by the Sentinels. His night-time outings as Daredevil take their toll on his marriage. He follows his wife one night to discover she is seeing another man. The next day Fisk has the man collected and brought to Fisk Tower. After a severe beating, Fisk takes a gun and kills the man. Fisk isn't just making up for past sins of his family. He is also making up for his own as the current Kingpin. 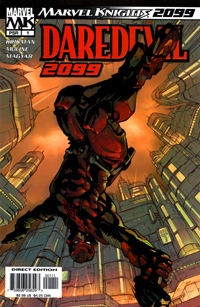 I was initially very harsh on the Marvel Knights 2099 one-shots back in 2004. Mostly due to my disappointment that these have NOTHING to do with the original 2099. I've mellowed in my opinion of these with the benefit of hindsight. It's not to say I now love these, but I don't hate them either. Rereading them back to back, I am struck at how despite each one being individual stories not connected to one another, they read much better when read together. This is another benefit over the first time I read these. 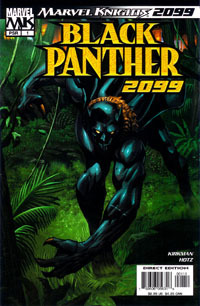 Back in '04 I only read Black Panther 2099 (only one with Doom). The others I have read individually over the years. Rereading them now all together I can see a certain "Marvel Knight-ness" which completely eluded my first reading. All of the issues, except Mutant 2099, have a certain grit and edge. 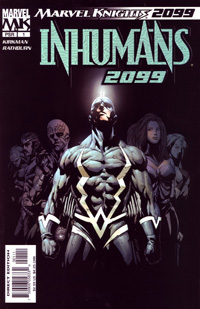 Inhumans 2099 is by far the bleakest of the bunch. And again, reading it just by itself I was left with a certain emptiness. But read together with the others and you can enjoy it as just one slice of a bigger picture. A picture of a new 2099. While I'll never love it like the original 2099, MK 2099 has its share of interesting ideas which, looking back, I would have enjoyed seeing them explored further. Chronok, a villain from the future, leads his army into the past to conquer the world. 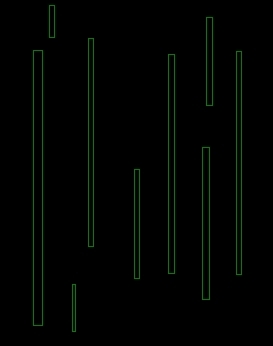 Having compiled a detailed list of super-heroes, Chronok and his army manage to surprise and kill Earth's mightiest heroes before they can retaliate. Captain American, Iron Man, Spider-Man and many others are killed quickly. Lesser known heroes like Gravity and Darkhawk manage to evade execution. After seeing his comrades killed, and managing to escape with his life, Darkhawk heads to New York to try and help stop the villains. 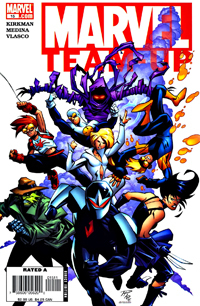 The world's last surviving heroes are Darkhawk, Speedball, Dagger, Araña, X-23, Gravity, Sleepwalker, and Terror Inc. The group make a last stand in New York city. Overwhelmed, the group quickly choose to flee. Araña is killed during their escape. However Speedball manages to steal Chronok's time travel device, the Chronometer. The group decide to travel back to Chronok's time, a month before he attacks, in order to stop these events from happening. After activating the chronometer, the team arrive in the year 2099 and they are met by Chad Channing, aka Mutant 2099. With no sign of the surviving heroes, and discovering that his Chronometer is missing, Chronak concludes they have escaped through time. However he isn't angry to be trapped in the past. He's content to rule the world he has just conquered. 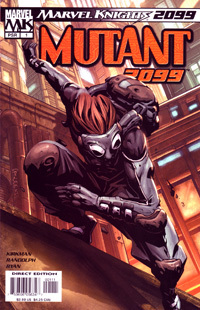 In the future year of 2099, the heroes meet Chad Channing, aka Mutant 2099, who takes them back to his hideout. There the group meet this future's disembodied Reed Richards. Reed fills them in on current events in 2099. They likewise explain their mission. Reed and Chad agree to help, especially when they realize that the Chronometer is Reed's own technology. Chronak will steal it from his lab in a month's time. The heroes train and prepare for that moment over the course of the month. 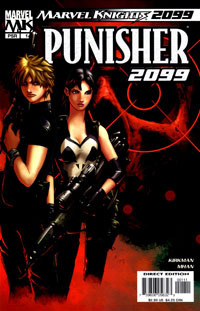 During that time, the heroes become at home in 2099. 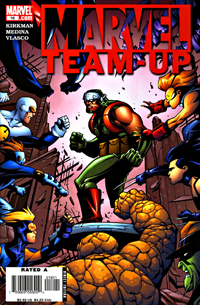 Darkhawk also emerges as the leader of the group. Finally, at the end of the month, Chronak and his army attack. The moment the team has been preparing has come. Chronak and his army attack Reed's lab. After a fierce fight, it appears all is lost when Chronak grabs hold of the Chronometer. However just as he open a portal, Darkhawk breaks the device while Chronak is only half-way through, thus literally cutting Chronak in half. Following their victory, the heroes are all excited to return home. However Reed informs them that their actions have not changed the past of their home-world. They have spawned a divergent time-line where Chronak doesn't take over. The heroes, with various levels of disappointment, remain in the year 2099. Squirrel Girl travels to the year 2099 to convince Speed Ball to come back to the past with her because the Speed Ball from her time has become Penance. If there is one thing that shines through Robert Kirkman's "League of Losers" storyline, is that he really loves 90's Marvel. The four part story is a love letter to the 90's characters which make up its cast. As this version of 2099 has never again (the GLI one shot aside) been revisited, its nice to see its creator give it a swan song of sorts. Any enjoyable storyline, and it was nice to revisit MK 2099. My only question is why didn't Reed mention they would not be able to go home in the first place? Perhaps to not dishearten them? Seems like they should have been angry at him. But Marvel's rules on time travel have always been loose. With regards to the GLI Summer Fun Spectacular....nothing much to say...its really just a joke isn't it? And as far as I understood it, Speed Ball doesn't go back [he's not shown returning with her, so this is just an assumption on my part. I believe 616 Speedball eventually does discard his Penance alter-ego].